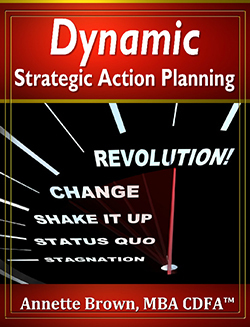 You need Dynamic Strategic Action Planning, a systemized plan with action steps that leads to success. Effective Strategic Plans take action. They are used regularly, reviewed regularly, change regularly; they are dynamic and fluid by design and intent. Regularly corresponds both to your business cycle as well as the cycle of goal and goalette completion. Examples of businesses and their logical cycles follow: a non-profit building homes in impoverished areas might be reviewed on a project basis, while a start-up business might be reviewed on a weekly basis. Critical to the success of any Strategic Plan is the ability of all people at all levels in the organization to know what their part or role is, in order to give them the ability to contribute to the organization with their full potential. Each person in the organization must perceive their role to be crucial to the achievement of the goals. Each action must lead toward achievement of the goals. Each person finds a match between what their roles are, how they contribute, and what they are being required to do, act upon, and achieve. Assessment criteria must lead directly back to goal achievement. There are 5 major questions to ask in creating a living, Dynamic Strategic Action Plan that can be implemented at all levels in your organization. These five questions will be asked over and over in the Dynamic Strategic Action Planning process. You will set up cycles of review for each Goal and Goalette, with Action Plans that lead to results. What you focus on gets done – Focus on your Goals and Goalettes. What you give attention to gets done – Review your progress regularly. What you measure gets done – Set realistic criteria for achievement and assess your results. Simple, yes. Easy, not always. It takes discipline, focus and consistency to achieve your PURPOSE. Create a business plan that will help you find your targets, stay on target and meet your goals — FAST! Do you have a business plan that you can bring to an investor, foundation or bank? It has to be concise and thorough! It has to be STRATEGIC! Do you have well defined, measurable goals with goalettes to help drive your actions forward? Can you translate your goals into Budgets? Can you translate your goals into time specific ACTIONS? Do you really know which goals are your priorities? Download our 15 Minute Business Plan — Create your own Business Plan that will INSPIRE you to ACTION! Annette offers Strategic Planning Guidance Services to small businesses, offering expert financial support and consulting for growing your business or dissolving marriages or business partnerships. Annette grew up in San Francisco, has an MBA from USF, is a Certified Divorce Financial Analyst™, Registered Tax Preparer, Insurance Broker. She continues to call North Beach home and is proud to be a native of California. She loves the great variety that California offers, and its diversity in landscape and people. Contact Annette and let her assist with the Strategic Planning for growth or for exit strategies.